There really aren't enough green things appearing on this blog. I'm currently suffering from carb overload from and decided last night, after the annual post-fireworks curry that I need to make more vegetable based things. So what do I do today? Discard the recipe for eggs Florentine (spinach, onions - green enough??) that I'd been planning for breakfast as I don't have any sabayon dishes to pop under the grill and instead, I decided to give Dame Mary's coffee battenburg from the Great British Bake Off a whirl. Whilst my character was busily being assassinated earlier this week at a management 'development centre' (a course to most people), I was reminded that I'm always on the defensive about everything. I always have to justify myself even when someone asks me a simple question. The husband will say 'Oh, you have new shoes?' He's looking for me to say yes. Instead, I will always launch into some huge explanation about how they were cheaper than getting my old ones re-soled and heeled (shoe repairs are extortionate) plus they were in the sale, and they are blah blah blah blah.... until his eyes glaze over and he wishes he'd never bothered to ask. You'd think he'd've learnt by now that he should say 'I like your new shoes' and then I might just say 'Thank you' instead. Although knowing myself on that front as well as I do, I would probably still give a five minute justification. Which is why my blogs are never short and why I always wander of on tangents. Today's justification is that I wanted to give this recipe a go because I intend to put one in my father-in-law's christmas hamper but didn't want to test it out the night before the hamper needs packing. Last year, I turned every local supermarket upside down looking for a last-minute battenburg but none were forthcoming and he ended up with a box of bakewell tarts instead. Like my husband, he finds shop-bought cake perfectly satisfactory. I still refuse on a matter of principle and so he will get homemade cake in his hamper this year, whether he likes it or not. If the husband gets to try a bit of this cake (I may well take it to work tomorrow) he will inform me that a) it's not real battenburg as it's not pink and yellow and b) it's too dry and not soft enough. Husband, that is because it is real cake and has not been rammed full of chemicals to make it all soft and fluffy and able to sit on a supermarket shelf for 12 months. I know which I'd prefer. Slightly lopsided - I blame my scales! 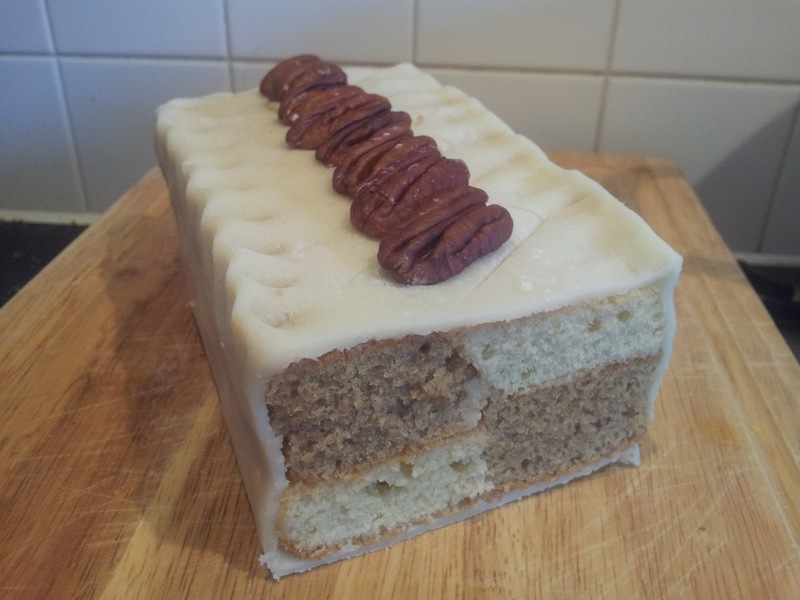 As it's a 'whole' cake, I've not had a slice yet, I've just tried the trimmings from the edge. It does seem a little dry and it's a bit lopsided as the vanilla sponge didn't rise as well as the coffee one. I did try to weigh the mixture when I divided it but my scales are well and truly burgered and I have a feeling that this may well be why it's not the finest sponge I've ever made. But it may be much nicer with the lovely coffee buttercream and marzipan that's now been added to it. So new scales, a new washing line (that's another story) and a new dog-proof gate for the kitchen are on this week's shopping list. But definitely no shop-bought battenburgs! Incidentally, I got a tweet from the lovely @HollyBellMummy today in response to my question to her about whether it's best to use butter or marg in cakes. She uses Stork in her cakes so I will be taking her advice, saving me from having to soften my butter on top of my radiators and thus avoiding greasy puddles on the floor when I forget to remove it quickly enough! Another top tip if you need soft butter and yours is straight from the fridge - grate it. Yep, that's right. Get a box grater, use the fine side, not the thick side and it will give you a huge pile of pretty soft butter strands.